Silicone jointed glazing for a flush outer surface. Ventilation option for natural ventilation in accordance with Building Regulation (E&W) Approved Document F available. Automatic Opening Vents (AOV) for smoke ventilation can be accommodated. Non-Fragile to ACR[M]:001 Class B. 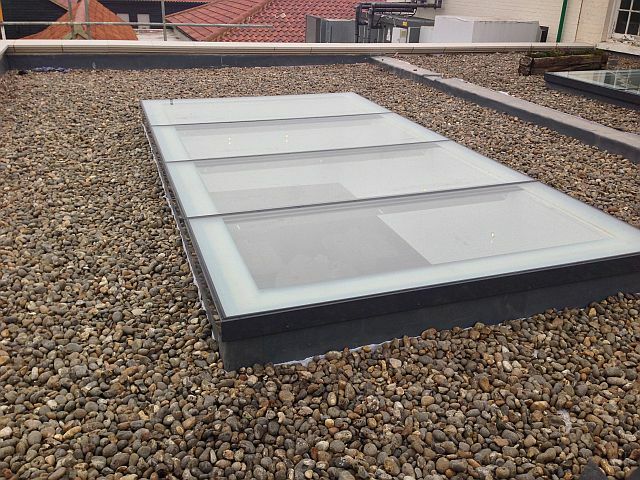 Square and rectangular rooflights are available in one glass pane, to suit variable kerb sizes up to 4.8 m² total size. Larger sizes are available with glazing bar divisions. Circular rooflights are available in one glass pane, up to 2.3 m diameter. Larger sizes up to 5 m diameter are available with glazing bar divisions. Double or triple glazed units can be contained within a single frame to cater for a wide range of sizes. Elliptical and irregular shaped rooflights are also available. Triple glazed total product U value 1.2 W/m²K. Purpose made in variable sizes up to 4.8 m² or 2.1 m diameter in one double glazed glass unit. Larger sizes are available by using more than one glass unit and glazing bars. Consult with Roofglaze for details. Up to 1800 mm span: 63.5 x 50.8 mm glazing bar. 1800–2200 mm span: 76.2 x 63.5 mm glazing bar. 2200–2800 mm span: 76.2 x 76.2 mm glazing bar. 2800–3500 mm span: 101.6 x 101.6 mm glazing bar. 3500–5000 mm span: 60 x 125 mm glazing box. A wide range of glazing options are available, please consult Roofglaze for exact details. Single panes over 3 m² will require the enhanced glazing specification. Outer 8 mm toughened clear glass with sandblasted border. 12 mm cavity, argon filled, silicone bonded. Inner 8.8 mm laminated clear glass with soft coat low E coating (low E not required with Solar Control). Outer 6 or 8 mm toughened clear glass with sandblasted border. 14 mm cavity, argon filled, silicone bonded. Inner 6 or 8 mm toughened clear glass with soft coat low E coating (low E not required with Solar Control). S Self Cleaning / Easy Clean coating. Polyester powder coated RAL - Insert colour requirements. Standard colours are Grey RAL 7015, White RAL 9910, Black RAL 9005.